If you can find one of these buy it, they are very hard to find. 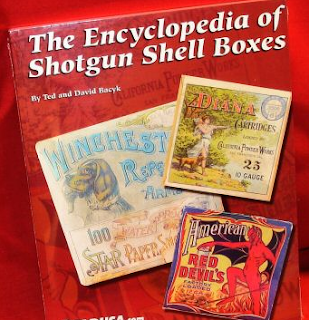 This out of print first edition soft cover reference book considered by many as the "Bible" of shotgun shell box collecting. The book contains 212 pages of high quality full color images. Covers of 98%-99% of all 2 pc. and some 1 pc. boxes manufactured in the US. The book remains sealed in original shipping plastic, color plates, values and comparative rarity values assigned to each box. A must for serious shotgun shell box collector. Out of print now for over 10 years.